D=99mm/H=80mm. Slip Lid Can 500 ml made of tinplate 2-part, inside food-safe gold lacquered and outside matt black printed. Versatile, elegant packaging solution! With silica bag lid for aroma protection. Our Dry Cans are Slip Lid Cans made of tinplate with Dry Can - closure incl. silica bag for aroma protection and keeping your filling goods dry. - Versatile usable for many different filling goods. Ideal for packaging gifts, jewelry, food such as sweets, candies, coffee, tea, cocoa, spices, herbs or nuts, as well as a variety of creams, waxes or pastes. All Dry Cans are made of tinplate (tinned sheet steel). Cans made of tinplate are not suitable for water-containing filling goods or moist storage/handling. Contact with water or moisture can lead to rust. Due to the gold lacquering and seam-cover on the inside of this can certain residual moisture or a very low water content of the filling good is possible. 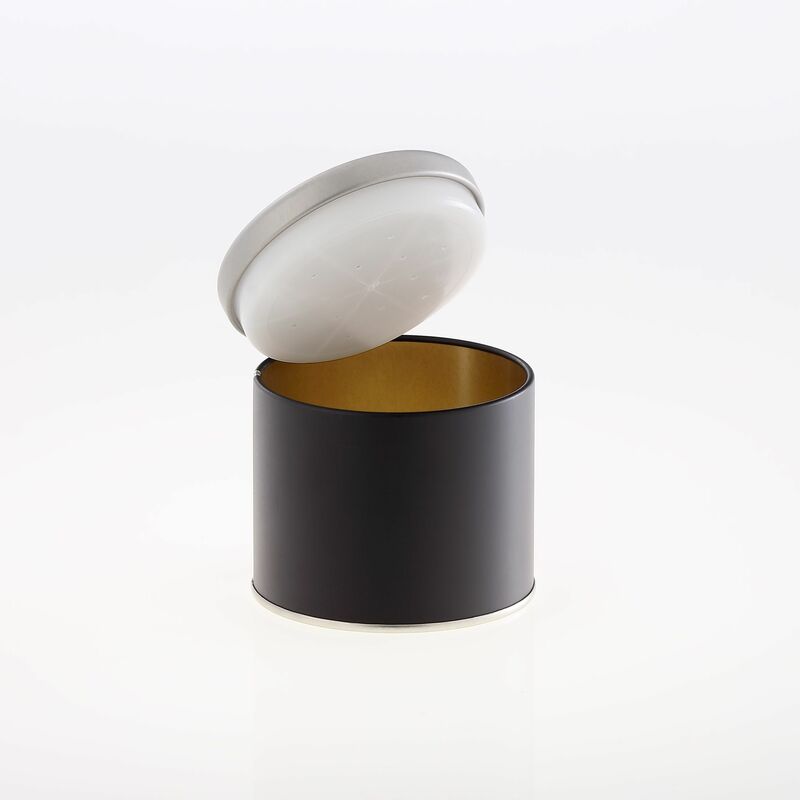 This Dry Can is inside food-safe gold lacquered and outside matt black printed. The Dry Can-closure offers additional aroma protection for your product, improves the tightness of the can and, due to the silica bag in the lid, keeps your filling goods dry. All Dry Cans are delivered with Dry Can-closure. All Dry Cans are suitable for food.